Learn how to hire inbound marketers and organize an outstanding inbound team. Are you hiring the right Inbound Marketers? Not just any marketer can make a great inbound marketer. And not every organization type is optimal for an effective inbound strategy. 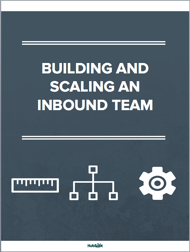 In this ebook, you will learn what makes a great Inbound candidate and how to structure your team for success.